The falcon field trip is coming up. Crystal Ross is the Division's social media coordinator. She loves to go fishing, camping, birdwatching and hiking. When she's not busy working in the field or at her desk crafting stories for social media, she's likely with her family in Utah's great outdoors. Thanks to the web cameras set up in the nest box downtown, we’ve been able to watch (in high def!) this year’s lone peregrine falcon chick grow from a tiny fluffball into an almost-adult predator preparing for life outside the box. Seeing the little one eat is something I never grow tired of watching. This year’s only falcon chick, shortly after it hatched. Photo taken May 24. But do you know what’s even better than seeing falcon action in high definition? Seeing it right in front of you! By attending the free field trip happening this week, you’ll have the opportunity to visit the falcon nest box site and, with the help of a scope and binoculars, see the falcon family in the flesh. It’s quite exciting to be there on site, witnessing the adult peregrines fly to and from the nest, delivering meals. It’s definitely a different experience — seeing the birds off screen. Bob Walters, DWR’s watchable wildlife coordinator, will lead the field trip as he has the last several years. He’ll cover the history of the city’s beloved falcons, details about the nest box’s location and ways the public can get involved in helping the birds as they learn to fly. Interested in being on the Salt Lake City Falcon Rescue Team? This field trip is the first step. It serves as sort of a volunteer orientation in which Bob goes over what kind of help we’ll need during Hell Week (expected to begin Wednesday, June 26). Even though there’s only one eyas fledging this year, we’ll still need assistance in ensuring its safety! Wherever that bird lands, we’ll need to be there to pick it up and return it to the rooftop. This process goes on for weeks, until the kid perfects its flying skills and ventures off into the world. 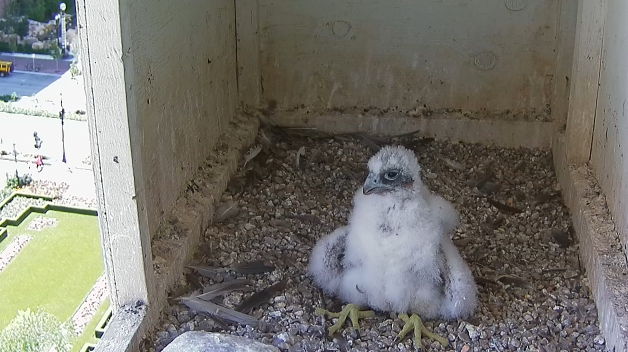 A more recent shot of the falcon chick. Photo taken June 14. You can read more about what it’s like to be on the team in this earlier blog post. Bob says that this event is a good way to not only talk about the falcons, but also to showcase the many other birds that occupy the area. If you have any interest in Salt Lake’s feathered residents, you won’t be let down. To get your name on the guest list for the field trip, be sure to call Bob at 801-209-5326. We’ll meet at Temple Square at 6 p.m. on Thursday, June 20. We’ll have a scope and a few pairs of binoculars, but bring yours too, if you have them available. I hope to see you out there! What is the status of the SL Peregrine falcons? 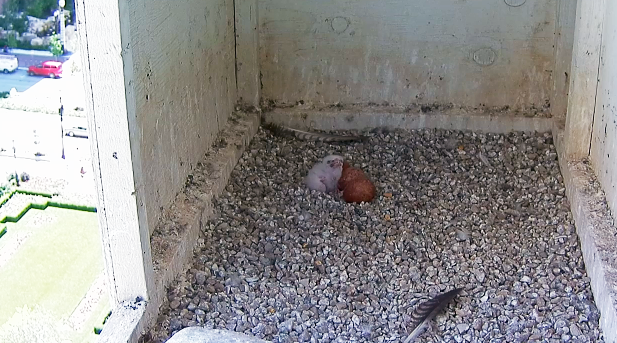 I’ve been looking for updates on the birds…how many eggs have hatched. The cams I’ve been sent to are 2-3 wks. old…how come? Hi there. The peregrine falcons are currently nesting downtown. Four eggs have been laid, and we expect them to start hatching May 16-18. Perhaps you are looking at the wrong cameras? You can see the current live feed of the Salt Lake falcons at wildlife.utah.gov/peregrine. You can also get updates on the falcons at the Facebook page: search for Salt Lake City Peregrine Falcons. Thanks for inquiring!